As much as I hate to admit it, when I think of gymnosperms my mind autopilots to conifers and ginkgos. I too easily forget about some of the other extant gymnosperm lineages with which we share space on this planet. Whereas one can easily pick out a conifer or a ginkgo from a lineup, some of the other gymnosperms aren't readily recognized as such. One group in particular challenges my gymnosperm search image to the extreme. I am, of course, talking about a family of gymnosperms known as Gnetaceae. 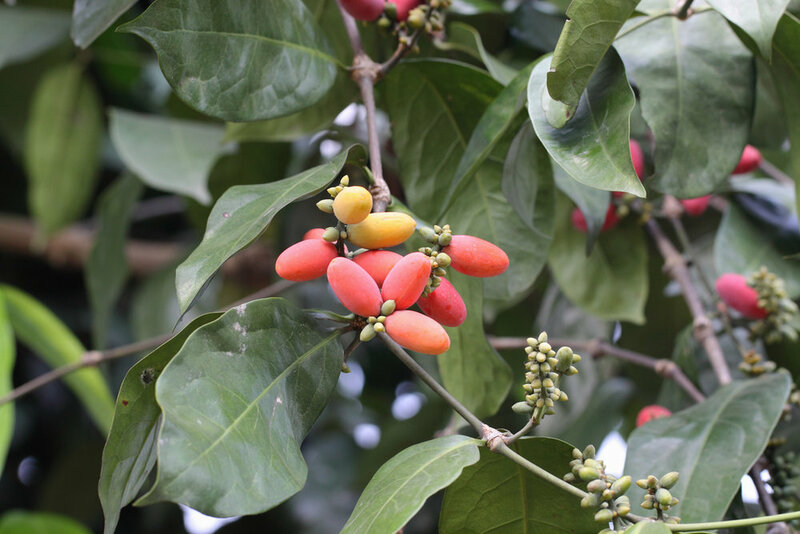 Gnetaceae is home to a single genus, Gnetum, of which there are about 40 species. They can be found growing in tropical forests throughout South America, Africa, and Southeast Asia. Gnetum essentially come in two forms, small trees and larger, scrambling vines. To most passersby, the various Gnetum species appear to be yet another tropical angiosperm with elliptical evergreen leaves. Indeed, the various species of Gnetum exhibit features that suggest a close link with flowering plants. This has led some to hypothesize that they represent a sort of living "link" between gymnosperms and angiosperms. We will get to that in a bit. First, we must taker a closer look at these odd plants. We will start with their leaves. They are quite strange by gymnosperm standards. Gnetum produce elliptical leaves with reticulate or web-like venation. Also, their vascular tissues contain vessel elements. Such traits are usually associated with dicotyledonous angiosperms. Characteristics such as these explain why the taxonomic position of Gnetaceae has floundered a bit over the years. What about reproduction? Surely that can help gain a better understanding of where this groups stands taxonomically. Gnetum reproductive bits require a bit of scrutiny. They are certainly not what we would call flowers. They aren't quite cones either. The technical term for gymnosperm reproductive structures are stobili. 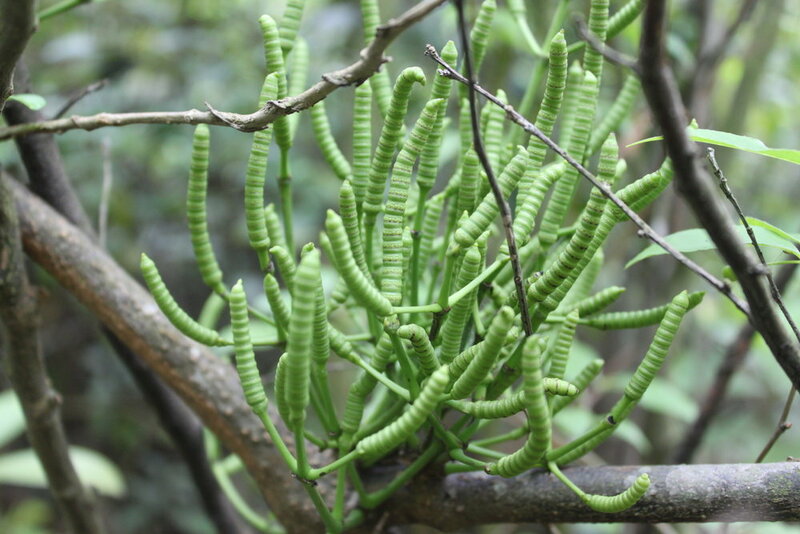 In Gnetum, these arise from the axils of the leaves. They are strange looking structures to say the least. Male strobili are long and cylindrical. They, of course, produce pollen. They also contain infertile ovules whose function I will get to in a minute. Female strobili, on the other hand, are larger and consist of ovules enclosed in a thin tissue or integument. Pollination in Gnetum is largely accomplished via insects, though wind plays a significant role for some species as well. In insect pollinated species, the female strobili emit a strong odor and secret tiny beads of liquid called "pollination droplets." Pollination droplets are also secreted from the sterile ovules on the male strobili. It was observed that moths were the main visitors for at least two species of Gnetum. The reason both sexes produce pollination droplets is to ensure that moths will visit multiple individuals in their search for food. Following pollen transfer, even more angiosperm-like activity takes place. Some Gentum undergo a type of double fertilization that is quite unique among gymnosperms. Double fertilization is largely considered a defining feature of flowering plants. It is a process by which two sperm cells unite with an egg and become the embryo and the nutritive endosperm that will fuel seedling growth. Along with its cousin Ephedra, Gnetum double fertilization also involves two sperm cells, though the end result is a bit different. Instead of forming an embryo and an endosperm, double fertilization in Gentum (and Ephedra) results in the formation of two viable zygotes and no endosperm. Fertilized seeds gradually swell into large drupe-like structures. Integument tissues develop with the seed, covering it in a fruit-like substance that turns from green to red as it matures. As far as anyone knows, birds are the main seed dispersal agents for most Gnetum species. Taken together, their peculiar anatomy and intriguing pollination have led many to suggest that Gnetum are more closely allied to flowering plants than they are gymnosperms. Certainly it is easy to draw lines from one dot to another in this case but the real test lies in DNA. Are they highly derived gymnosperms or possibly a so-called missing link? No. Recent work by the Angiosperm Phylogeny Group found that Gnetaceae are more closely related to the family Pinaceae than they are any of the sister angiosperm lineages. Their work also revealed that, although this lineage arose some 250 million years ago, much of the diversity we see today is the result of rapid speciation events during the Oligocene and Miocene. It would appear that these derived gymnosperms are not the missing link they we once thought to be. In fact, the whole concept of an evolutionary missing link is flawed to begin with. Still, this should not take away from fully appreciating the bizarre nature of this family. The uniqueness of the genus Gnetum is certainly worth celebrating. They serve as a reminder of just how diverse gymnosperms once were. Today they are a mere shadow of their former glory, overshadowed by the bewildering diversity of angiosperms. If you encounter a Gnetum, take the time to appreciate it as a representative of just how strange gymnosperms can be.